NAPLES — Ignition Athletics Performance Group held a speed training camp for youth football players at Barron Collier on Saturday afternoon. 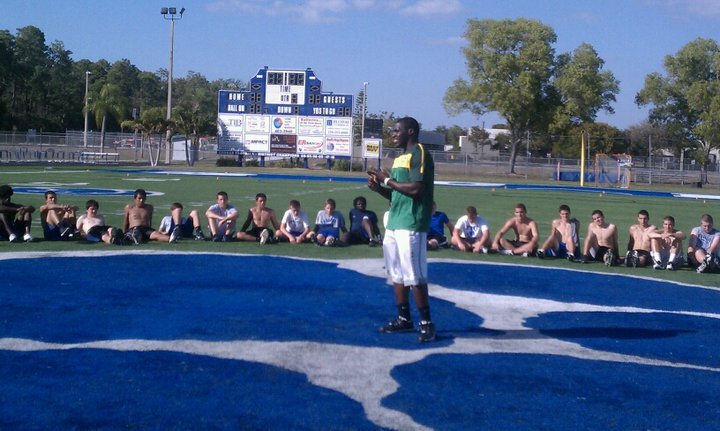 Ignition is currently in Naples conditioning NFL prospects getting ready for the NFL combine at the end of this month. Performance director Clif Marshall and his staff brought several prospects to BCHS to speak and coach the youth players. “We’re going to work the guys on the same drills and the same fundamental techniques that we’re working the NFL prospects on — becoming faster, becoming quicker, more explosive, more agile, and just overall to become a better athlete,” Marshall said. Among the prospects in attendance was Texas defensive lineman Sam Acho. Acho, a two-time All-American, had a stellar senior year with 59 tackles (17 for a loss), nine sacks, 18 pressures, five forced fumbles and led the nation with five fumble recoveries. Acho graduated from Texas in December to focus on his training in Naples and improve his draft stock. He didn’t want to worry about online classes or homework. Several mock drafts have the defensive end slated to be picked up in the second round. Acho is looking to improve that position performing well at the combine and Texas’ pro day. There isn’t a specific team the Dallas native hopes to play for in the NFL. Impressed with his off-field character, as well as athletic ability, Marshall brought Acho in to speak to the players about more than just being a football player. The Longhorn spoke to the approximately 100 youth athletes about the importance of loving what they do and stressed the importance of academics.